It is as popular as ruby or emerald but because it is more common it is also more affordable. Aquamarine is a member of the beryl family which also includes emerald. It has a hardness of 7.5-8 on the Moh's scale and a wonderful shine. Iron is the substance which gives aquamarine it's color. Aquamarine is mined primarily in Brazil, Africa, and Madagascar with lesser sources in Russia, China and The United States. It's lovely blue colors inspires such names as Santa Maria, Espirito Santo, and Martha Rocha to differentiate the sources. Many aquamarines are greenish or pale blue when mined and cut. 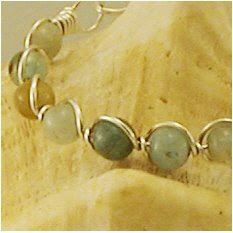 Those gemstones are heat treated to provide a purer blue color. Most aquamarines on the market today are heat treated. Heat treatment is permanent so these stones do not require additional care. Because of it's strength aquamarine does not require special care. They may be cleaned with a soft cloth or mild soap and water. The FamiLee Jewels will be featuring aquamarine jewelry in our weekend storefront At The Warehouse 20 Learned Street Albany NY Weekends 10-3.